We read with shock, the lies spewed out by Barrister Vincent Egechukwu Obetta in his interview with Petrus Obi of Sun Newspaper on June 21, 2016. To put the records straight, Barrister Obetta was sacked by the leader of Indigenous People of Biafra (IPOB), Nnamdi Kanu. For working with the DSS to indefinitely detain Nnamdi Kanu, Barrister Obetta was fired by our leader in person when Obetta visited him at Kuje prison. It is on record that you, Obetta, refused to work with other lawyers knowing fully well that this is a major international case requiring the input of more than one person (Obetta) who as it turns out is a lecturer and not actually a practicing lawyer. For the avoidance of doubts, it was Barrister Gab Egbule that secured Nnamdi Kanu’s bail at the Magistrates Court and not Obetta and the records are there to prove it. It is also on record that Barristers Ifeanyi Ejiofor and Gab Egbule prepared the arguments that led to the respected Justice Ademola dismissing the frivolous DSS charge of terrorism and not Barrister Obetta. It must be revealed to the entire world that when unconditional release was ordered by the court, Barrister Obetta refused to file contempt of court charge against the DSS for failing to obey court order. Had Obetta filed this charge against Buhari and his DSS on behalf of our leader, no court would have had the effrontery to continue with the bogus charge of treasonable felony. It is no secret that Barrister Obetta worked hand-in-hand with the DSS for financial reward to sabotage the genuine efforts of other lawyers working to set Nnamdi Kanu free. It was Obetta that connived with the DSS to advice our leader to reject Justice A. R. Mohammed on the grounds that he is a Hausa-Fulani Muslim when your fellow lawyers advised you that Justice Mohammed is a good man. You, Obetta, knew that the removal of Justice A. R. Mohammed will result in a biased judge like John Tsoho being brought in to handle the case. Why did you, Obetta, not stand up in court to reject Justice Mohammed rather than advising your client, Nnamdi Kanu, to do so thereby effectively condemning him in the eyes of Nigerian judges who feel slighted that one of their own was rejected in an open court? Barrister Obetta, can you tell the world where you got the money with which you bought a house at Trans-Ekulu in Enugu? You, Barrister Vincent Obetta, openly canvassed for political appointment at DSS office as a reward for ensuring that our leader remained behind bars. It is known to everyone that you, Obetta, connived with DSS to continue the illegal detention of our leader at DSS dungeon when he should have been transferred to a prison facility as he is now. We would like to ask: did you Obetta not advice our leader to discontinue the court case and remain indefinitely in prison? These are the reasons why you were sacked. You did not resign, you were dismissed. Any lawyer in the defense team of our leader who is found to be afraid of the Nigerian Government, DSS or any of her agents will be sacked no matter who you are. The case against our leader is the biggest legal case in the history of Nigeria and we won't let anyone mishandle it. It is worthy to note that Barrister Obetta met with Igbo politicians without briefing his client. If Obetta resigned, how come he ran away with the case file? Obetta thinks IPOB is an amateurish organisation but he and his DSS handlers are clearly mistaken. Barrister Obetta will still be cited to the relevant legal authorities for gross misconduct. If he is in doubt he should ask Judge John Tsoho who will most definitely be disgraced out of office. 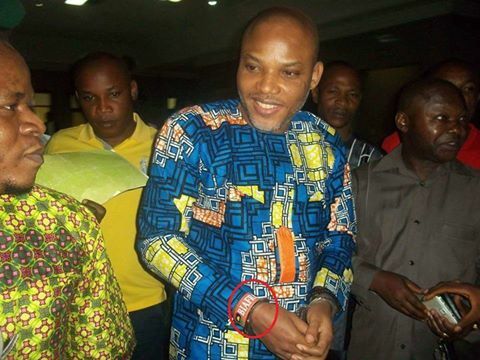 Obetta after sabotaging our director Mazi Nnamdi Kanu you still got the mind to buy house in our land instead of doing such somewhere else either at Abuja or Lagos, what I want you to understand is that as long as we are alive you can't stay inside that house in peace because we are coming for you any day anytime so you gotta be ready for us. Maybe we will start with you first before going for other people sabotaging our restoration process for Biafra. Just know that your days are numbered.